Charlie Markbreiter reflects on New Orleans-based artist Dave Greber’s 52-channel video installation in New York and the role of public art. 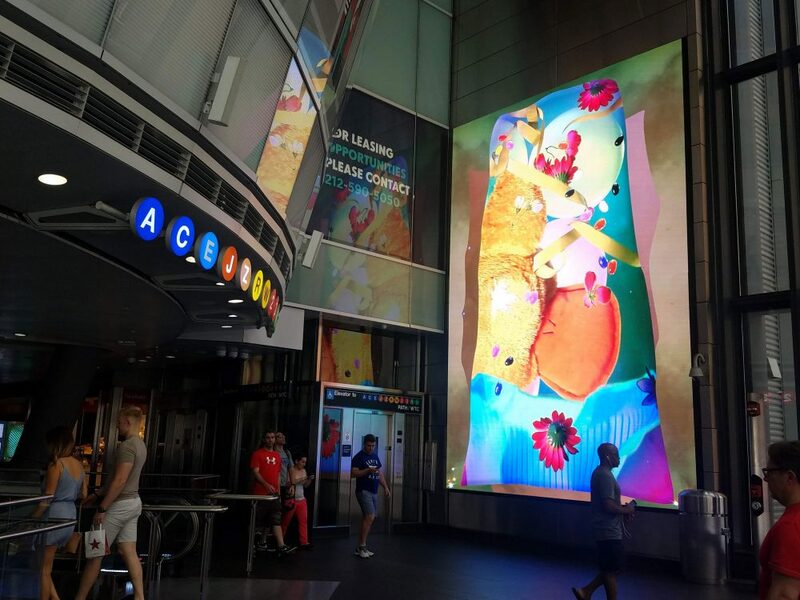 Installation view of Dave Greber’s SkyyysTM, 2018, at Fulton Center and Dey Street Concourse, New York. Courtesy the artist. Skyyys™, the 52-channel video installation by New Orleans-based artist Dave Greber, wasn’t meant to be viewed in its entirety by a single visitor; instead, it was designed for train commuters, whose rolling, frenetic pace it simulates across Manhattan’s Fulton Center and Dey Street Concourse. The piece plays for two minutes at the top of each hour. In the video, an array of whooshing commodities flow across the screens. Violet satin cloth unfurls; an elephant plushie hits the screen and bounces off. Perhaps Skyyys™ exemplifies “zaniness,” an aesthetic category that theorist Sianne Ngai argues is particular to post-Fordism. “Zaniness is essentially the experience of an agent confronted by—even endangered by—too many things coming at her quickly and at once…It evokes the performance of affective labor—the production of affects and relationships—as it comes to increasingly trouble the very distinction between work and play.” Greber’s floppy disks, bananas, and potted orchids bop placidly against each other, merging now and then like bubbles under water. Skyyys™ is in one of the tunnels leading up to the Oculus, the physical and cultural center of the World Trade Center Transportation Hub and mall, completed 15 years after 9/11, in 2016. Skyyys™ was commissioned by MTA Arts & Design, whose website positions the subway system, not as a mode of transport, but as a museum. “As you travel through the Metropolitan Transportation Authority network, you experience a first-rate art museum comprised of works created in mosaic, terra cotta, bronze, glass and mixed-media sculpture…The founders of the New York City subway believed that every design element in the system should show respect for our customers and enhance the experience of travel.” MTA Arts & Design was created in 1985, as New York City was implementing a policy of “planned shrinkage,” or active de-investment in once affordable social services such as the City University of New York system and train travel with the aim of driving out low-income black and brown residents. Westfield Properties, which owns and operates Oculus’ shopping mall, and ANC Sports, a sports signage and marketing company, also provided technical support for Greber’s project. An excerpt from Dave Greber’s SkyyysTM, 2018. 52-channel video installation. Courtesy the artist. Walking through Skyyys™ leads you to the Oculus, where seating is sparse, arty, and minimalist. Low, white benches akin to blobby fidget spinners are scooted into the eaves of the Oculus (which, USA Today reported, “looks more like a stegosaurus than” the dove Spanish architect Santiago Calatrava intended.) There are spherical chairs with divots to sit in, each like an apple with a bite taken out of its side before being placed, self-satisfied, not in the trash, but back on the top shelf of the fridge. Tourists chill on the sphere-chairs, waiting for friends or lovers, or looking out into the high-end mall. At the time of my writing, COS was having a 50% off sale, and samples of a lifting and firming serum called Skin Caviar were being offered beneath the skylight. The mall, echoing Skyyys™’s bouncy flow of objects, is a reminder that, to quote Marx, “the wealth of societies in which the capitalist mode of production prevails appears as a vast collection of commodities.” A few people stood with one knee propped up on the chair, posing for photos; the chairs had justified their serviceability by doubling as public art. Skyyys™ succeeds in having colors, in making objects move in a fun way, in making people’s commutes a bit less boring and stressed. With that much space and money allotted, the piece could have been totally obnoxious, but it isn’t. The problem isn’t with Greber, or with public art, but that public art is too often tasked with generating the basic functions and illusion of collectivity that was supposed to be provided by the liberal democratic state. Neoliberalism’s extractive praxis decimates the time, space, and social services required to create what we imagine as a “public culture”—then inserts “art,” private property LARPing as a cover-all social service, into the void. This is not Skyyys™’s fault. At all. It’s impossible to make public art without a public sphere. That being said, anyone commissioned to do “public art” in New York City might want to consider just installing free, working bathrooms in whatever stock-image space they’ve been ostensibly asked to dress up as a commons. Dave Greber’s Skyys™, 2018, is on view through November 2018 at Fulton Center and Dey Street Concourse (200 Broadway) in New York.